Dose PicoSure work on tattoos on the upper part of your hands? I have a name on one hand and a design on my other. I would like to get them both removed. Is PicoSure the best tattoo removal treatment for hands? I'm considering getting a tattoo. How difficult will it be to have it removed if I don't like it? Can tattoo artists perform laser tattoo removal? Or are only doctors allowed to use the laser devices? Does laser tattoo removal work on lip liner? Can permanent lip liner be removed with the laser treatment? I want my new tattoo removed. Is it better to do it now while the ink is still fresh or wait until later? I have a new tattoo. I got it about last October and I want it removed. Is it better to do it now or wait? I really don't want any scarring or left over marks. What is my best option? Can laser hair removal get rid of any hair? Can hair on places like the underarms, pubic area, eyebrows, etc. be treated effectively? Should tatttoo removal be spaced out? I have a sleeve and I want the whole thing removed. Should I schedule it in installments, or can I have the whole arm treated in one day? 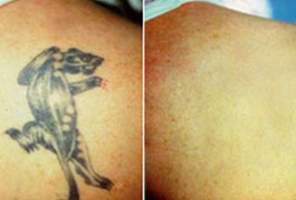 Does laser tattoo removal damage the skin? Is the skin damaged in any way after laser tattoo removal? Can exposure to the laser cause skin cancer? When my tattoo healed, it scabbed really badly and half of the ink fell off. Would it be possible to have it removed? The tattoo is located along the side of my hand, along the edge. Half of the tattoo looks really faded and the other half looks really dark. It's a cross in black ink.